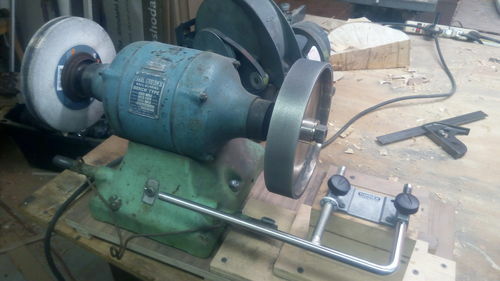 I have a DeWalt 8” bench grinder that I use for sharpening my turning tools. I would like to replace one wheel with a diamond wheel. any Suggestions? Is the Tormek T4 worth the money? Don’t buy diamond … go with CBN (Cubic Boron Nitride). CBN has higher thermal resistance than diamond, and is harder than diamond. I just bought a D-way 8” CBN 180 grit wheel for my grinder. It’s a game changer. I also bought some Tormek jigs and set them up on my bench grinder. 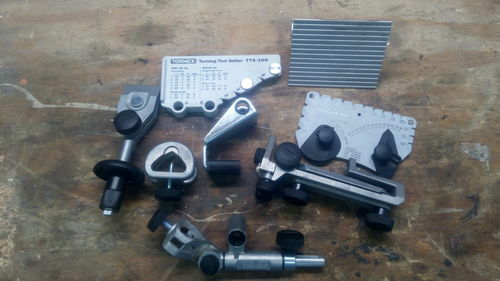 Works fantastic on HSS lathe tools. I’ve used it on plane irons, chisels, carving tools and so on. I have to be careful with the carbon tools on the final couple of passes to keep them from burning. My grinder runs 3450 RPMs. I would like to get a slower grinder or some sort of set up on a slower motor and set the Tormek jigs up on it. Really, with the CBN and a couple hundred bucks of Tormek jigs the Tormek is very replaceable. I had the opportunity to use a T-7 for a few days and ran it through all the tests. I really wanted to like it, I really did. I found it too troublesome, and slow. The wheels wear and they need to be trued up with a tool. You can change the grit of the wheel with a thingy(? ), and then there is the water which I don’t like. For a new T-8 and the jigs that I would want, I’d be looking at a bit over a grand. CBN wheel was 200, jigs about 300. The grinder I had in stock. Diamond is great on carbide, but not so good on steel. Diamond wheels clog up with steel. When I sharpen saw blades, I grind the steel with a resinoid bonded wheel, but have to switch to a diamond wheel when grinding the carbide tips. I second the wood turners wonders CBN wheel. I have one with a wolverine jig. Works great. Don t buy diamond … go with CBN (Cubic Boron Nitride). CBN has higher thermal resistance than diamond, and is harder than diamond. CBN has the same crystal structure as diamond, except boron-nitrogen bonds replace the carbon-carbon bonds in diamond. ... However, while CBN is substantially harder than other conventional abrasives, it has only 64 percent the hardness of diamond—45,000 N/mm2 Knoop, as compared to diamond’s 70,000 N/mm2 Knoop. CBN is not harder than Diamond, I second the CBN use for sharpening. Many thanks for the helpful replies to my query. I see that WoodTurners Wonders has a pair of Spartan CBN wheels for $180 (80 and 180 grits) that I am thinking of purchasing. I was just reading about the spartan wheels myself. My concern is that they are only 1” wide. Designed to fit the grinder and be able to leave the guard in place. to buy the radius edge was a mistake. I find it difficult to stay on the wheel sometimes while sharpening a bowl gouge. I wish I had bought the square edge wheel, and now the only option is the new Mega square. Its priced at what I believe I paid for the radius edge wheel a couple years ago. I also only have the 180 grit CBN wheel. I use a norton 80 grit stone wheel for rough work. Also was just on woodturner wonder site. looks like the spartan wheels are out of stock for some time. only 350 grit in stock. I only use it to change the grind on a new tool, if needed. Or if I damage a tool (drop it.) and need to fix it. So far I have not needed to re visit the 80 grit wheel. Reality, I have not touched the 80 grit wheel in over a year now. And I felt I could not justify the cost of the second cbn wheel. I like the look of the Mega square wheel. Should I get the 320 grit or the 180? I just use a 180, I have never used a wheel finer than that. I have a 180 CBN wheel on one side and white wheel on the other side. I don’t see a need for anything else. I use the white wheel for my homemade and non HSS tools. Thanks again for all the helpful replies. I have ordered the 180 grit CBN wheel from woodturners wonders.